The Hudson Reporter, flatly exposed issuing false assertions against Ravi Bhalla and his law firm by erroneously stating it controls the existing legal contract in the Hoboken Housing Authority, is attempting to cover up that misstatement among others. The cover up entails changing stories online in a likely attempt to bury statements that under NJ law are grounds for a defamation action. Yesterday, MSV pondered if one false statement was defamatory as it relates to both Bhalla's and his law firm's economic livelihood. The public silence from the Hudson Reporter may be partly due to being caught with their pants down in a less than obsequious political attack meant to tarnish Bhalla, his law firm and their respective business reputations. Bhalla is the current Hoboken City Council President, a force in the current Reform movement while the Hudson Reporter is a charter member of the Mason Media Complex, seeking to undermine the movement at every turn on behalf of its Old Guard allegiances and real estate interests tied to its origins. in a cover up replaced with yet new misstatements. Defamation anyone? In an indirect response to MSV, the Hudson Reporter -- with no public acknowledgement, correction, retraction or apology -- changed yesterday's story on at least one other story: in Al Sullivan's column last week "Between the Lines," replacing blatant erroneous statements with new misinformation. The Hudson Reporter revised story states Bhalla's current law firm was an active bidder for the HHA contract to recently replace the Carmelo Garcia advocate and longtime holdover Charles Daglian. According to a well-placed source, the reworked misrepresentation open another pathway to false and reckless disregard for the truth in the aftermath of the Hoboken City Council elections. Some view the false statements as pent up anger that the Garcia "ethnic cleansing" litigation emails failed to generate the intended election outcome. The Hudson Reporter, unlike the Hudson County View, failed to publish any emails in whole or in part, choosing to tell the public what to think about them and how they may tie to conspiracy theories. Last week, Reform trounced the Hudson Reporter's Old Guard allies in four of five contested council races Tuesday and awaits the County's certification of its 7-2 council majority come January. 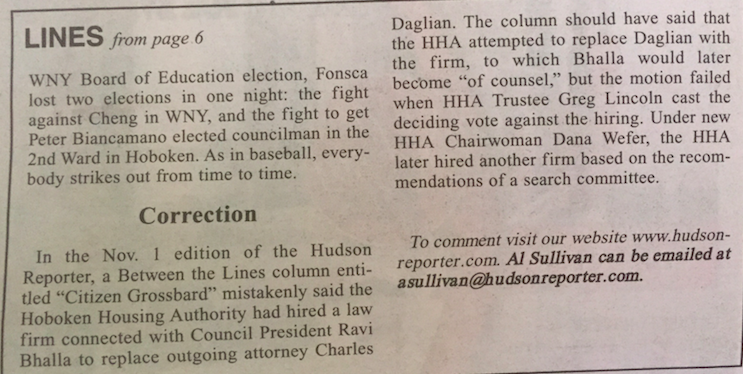 In the November 1 edition of the Hudson Reporter, Al Sullivan wrote as fact that Ravi Bhalla's law firm had taken over the legal contract, pointing a guilt-laden finger indicting him by saying he had "reason for keeping the emails quiet," in the Carmelo Garcia "ethnic cleansing" litigation. Hudson Distorter venom: Councilman Ravi Bhalla had "reasons for keeping the emails quiet" since he "eventually" joined a "firm that replaced the HHA attorney." Sully only soiled himself and the HR. Sullivan went on to state Bhalla's law firm replaced the HHA attorney. In truth, not only had the firm Florio Perucci not taken over the HHA legal contract, it hadn't even submitted a bid when Daglian was eventually replaced under interim Executive Director Bob DiVincent. The Hudson Reporter fixed the problematic story secretly altering the online version almost a week later. The new version incorrectly states Bhalla's law firm "vied" for the HHA legal contract. The addition of the word "vied" leads readers to believe the law firm in question bid on the latest legal contract in the HHA. The one time Florio Perucci bid on the legal contract came in early 2013 and it lost the vote on a resolution presented under the previous board months before Councilman Bhalla would interview and later be hired by the firm. The Hudson Reporter did not clarify or correct any of these facts, another woeful attempt at misdirection and sleight of hand. In the middle of the night Thursday, the Hudson Reporter was still at it, pumping out new distortions with an eye on muddying up Councilman Ravi Bhalla further. In that story, the statement clearly says Florio, Perucci was among "new firms vying to represent the Housing Authority....(and) also employs Ravi Bhalla. Again, the misrepresentation is not slick enough. In this case, there's no evidence whatsoever to show any bid was submitted to the Housing Authority under Bob Divencent after Florio Perruci had brought Councilman Ravi Bhalla on board. This is an obvious example of the worst kind of yellow journalism in league with the likes of Hoboken411, where half-truths and distortions were manufactured by Perry Klaussen's ghostwriting minion aligned at the hip of Beth Mason week in and week out until the FBI arrived into town to investigate tens of thousands of stolen emails out of the mayor's office in 2011. 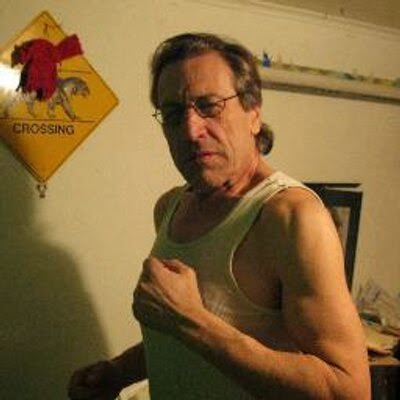 The Hudson Reporter when challenged in a MSV email yesterday to editor Caren Matzner, publisher Dave Unger and Al Sullivan offered no response to why it stated a contract was issued to Bhalla's law firm, Florio Perucci, where none existed. The secret alterations by the Hudson Reporter to recent stories in the face of public inquiry is a major journalistic violation -- but worse, in the legal context of a possible defamation claim it's an admission against interest. Business as usual at the pro Old Guard rag, the Distorter. Talking Ed Note: The Hudson Reporter, called the Hudson Distorter by many has seen frequent criticism for its open antagonism toward the Reform movement and its leader Hoboken Mayor Dawn Zimmer. 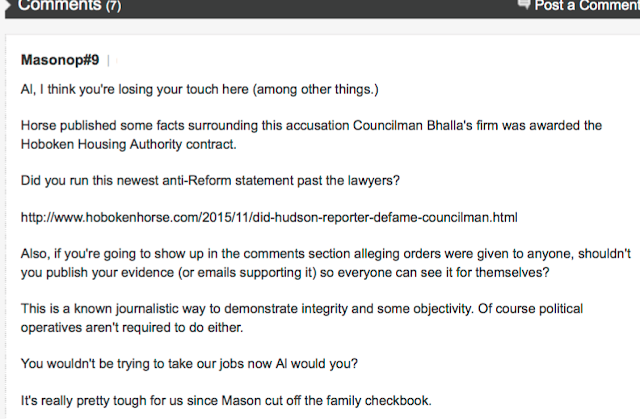 In addition to the cover up operation surrounding Councilman Ravi Bhalla, the Hudson Reporter took quick action when the facts of its hit job were highlighted in the comment section. The following comment was published but censored and quickly removed. While the Hudson Reporter was cleaning up its misinformation against Ravi Bhalla without issuing any correction, retraction or apology this comment vanished after it pointed to the fact Ravi Bhalla's law firm had not been contracted for the Hoboken Housing Authority's contract. Viva the cover-up! Let's see what happens if MSV readers attempt to link to this story and cite the factual problems of the Hudson Reporter's "objective journalism." Warning: your personal information may be collected and distributed with other distinguishing information re: email registration ala Hoboken411. Caution is the watchword. After all, this is the Hudson Distorter, home of Beth Mason's Media Complex. Update: After lobbing misinformation upon misinformation against Councilman Ravi Bhalla, the Hudson Reporter threw in the towel and actually printed a rare (first in years?) correction. The equivocating is largely missing and no additional mud is replaced with more mud this time. The context is not quite compete noting current Chair Dana Wefer conducted an actual, real open search for legal counsel. As MSV stated, Florio Perucci was not a bidder in that process. The legal counsel contract processes were conducted almost a year and a half apart and by a reconstituted Hoboken Housing Authority board. The reason the hole was dug so deep was the political bias in seeking to do a hit job against Councilman Bhalla leading into an important Hoboken council election. The Hudson Reporter waves the white flag. After repeated false statements against Councilman Ravi Bhalla, it's printed a correction of sorts pointing to a vote on the Hoboken Housing Authority a full year and a half earlier. That was some real sullying work there, even for the Hudson Distorter.